JDA was established in Uzbekistan in 1993 after the breakup of the Soviet Union to challenge and equip emerging Central Asian nations to build a foundation for the future, both to meet the needs of their people, land and give them opportunity to enrich other nations with the strengths and the resources that their people, land and culture have to offer. A JDA office was opened in Afghanistan after the fall of the Taliban in 2001, in the northern city of Mazar-e Sharif, to serve the northern Afghanistan region. This office still serves as the central base for JDA’s operations which are focused in the five surrounding provinces of Balkh, Samangan, Saripul, Jawjzan and Faryab. The main office houses the staff operations and small demonstrations in greenhouse production and oil press operations. Agricultural research and demonstrations are also carried out at the 0.8 ha JDA Research Center and 3 ha Development Center located outside of Mazar-i-Sharif. The Development Center is also equipped with a training center and several wells to carry out well drilling, installation and maintenance for the WASH program. JDA’s effectiveness in its Central Asian development work has been as a result of the networks and partnerships developed by its founder and president, Bob Hedlund, and through the experienced personnel that he has brought in through 20 years of work in the region. JDA’s objective is to assist in the transformational development of local communities by helping initiate and implement projects in areas of agriculture development, clean water, poverty alleviation, infrastructure development, community health education and emergency aid and relief. 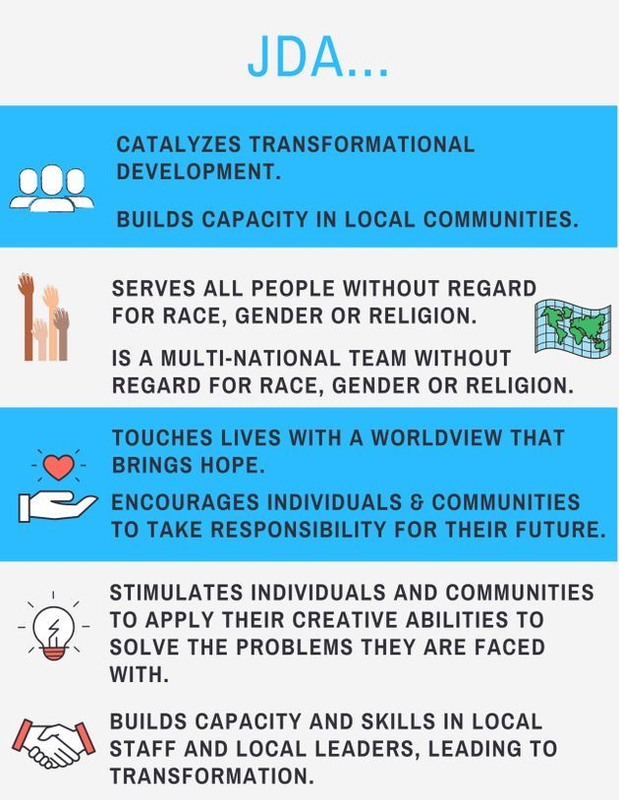 We believe each person has unique creative abilities to make a difference in their lives, in their families, in their communities and in their nation, and we seek to empower these individuals and communities to tap into this creative potential by facilitating community projects through organizational and technical support.